Question: What is the goal of a monk’s life? Fr. Luke: The goal of life not only for monks, but for any person, is deification. St. Athanasius the Great testifies to this: “God became man, that man might become God.” The Lord Himself says in Holy Scripture: Be ye therefore perfect, even as your Father Which is in heaven is perfect (Matthew 5:48) and Ye shall be holy, for I am holy (Leviticus 11:44). In many places in the Gospel, the Acts of the Apostles, and the Epistles we are told that the goal of human life is deification. It was so that this goal might become attainable that the Lord became incarnate. Through the Mystery of Holy Baptism, we become members of the Body of Christ, and through the Eucharist we can attain deification. Monasticism is most conducive to achieving the goal of human life. This is due to the fact that the life of a monk is a life of repentance. This is the mystery of repentance. From the moment that we take monastic vows our life becomes an unceasing sacrifice to God. We are called to dedicate all our strength to the Lord, to give of ourselves without reserve. A monk’s only desire and aspiration is always to be with Christ. Question: What can prevent one from attaining this goal? Fr. Luke: The main cause of young people’s repulsion from the ascetic life is the spirit of worldliness. This spirit does not allow one to love the Lord with all the strength of one’s soul, to want to be with God at all costs. Previously, when the spirit “of this world” had not yet penetrated so deeply, Christians raised their children in an atmosphere of piety. Children saw their parents attend divine services, pray, make prostrations, and go to Confession… It was much easier for children brought up in such a spiritual atmosphere to set out on the path of Christian life. Look at the Lives of Saints: the majority of ascetics were raised by pious parents. The life of St. Seraphim of Sarov especially impressed me. 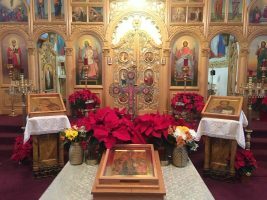 When St. Seraphim got sick as a child, his mother Agafia took the boy into the yard, laid him against the Wonderworking Icon of the Mother of the God of the Sign, and awaited her visitation. People had sincere and pure faith! Question: Can a monk make use of modern technology (cell phones and the Internet)? Fr. Luke: The sole and indispensible prerequisite for this is the blessing of one’s spiritual father. Without this blessing, the use of the Internet, cell phones, and other modern means of technology is dangerous. From the ancient Patericons it is clear that the use by monks of even seemingly innocent and innocuous items can be dangerous. The root of evil is not even the thing itself, or any means of technology, but the absence of obedience. One could cite a great number of examples of monks who used these or other objects willfully and therefore suffered a true spiritual catastrophe. It is no accident that cell phones and the Internet are especially dangerous for monks. These technological advances often lead to distraction of mind, and such a condition is entirely inconsistent with the goals of monastic life. After all, according to the teaching of the Holy Fathers, the monk is called to bring his mind into his heart through prayer and the ascetic life. As far as the Internet is concerned, I cannot say anything specific, since we do not have it in our monastery. But it is obvious that immersion in the “World Wide Web” leads to distraction of mind. This applies above all to hours-long journeys through Internet space without any concrete purpose. But if there is a blessing from the abbot and the monk himself is cautious, who by obedience goes online to look something up or do something on the Internet, online work is possible. But there is no Internet in our monastery. 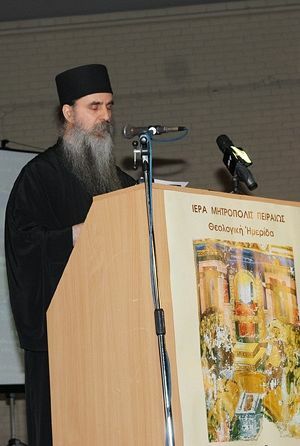 Our abbot [Archimandrite George (Kapsanis)] has not blessed us to use it. The danger faced by every user is too great. Many monks cannot resist this temptation. As far as the laity is concerned, many hours spent in idle, aimless wandering across the expanses of the Internet is also dangerous. Before starting any work online, one should set a specific task for oneself that needs to be accomplished, and not deviate from it in any way. 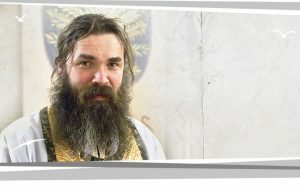 Question: How suitable is charitable work for monasteries? Fr. Luke: From church history, we have the example of many monks who were engaged in philanthropy. For example, St. Sampson the Hospitable or St. Basil the Great. Leading the monastic life, they combined asceticism with enormous social ministry. But these examples do not supersede the essence of Orthodox monasticism, which – in contrast to the West – is hesychastic rather than activist. The monk’s goal is to control his thoughts, to strive to purify himself from his passions, and become a vessel of Grace. If a given social ministry interferes with the realization of this main goal, then it brings the monk no good (and it will end in spiritual failure). We are not saved by external works (even good ones), but by our love for Christ, which is manifest in the pursuit of purity and the main goal of our lives: achieving deification. 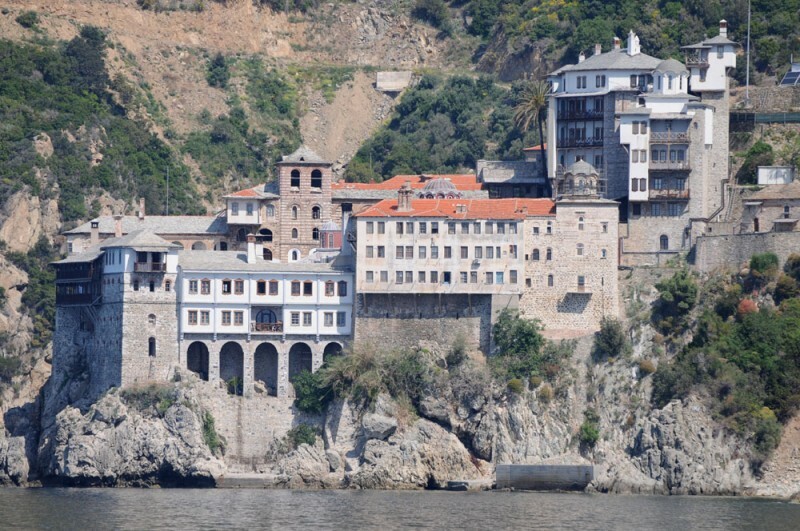 Social ministry combined with the forgetting of the main goal of the monastic life is not befitting of the Orthodox East. Monks who set out on the path of active service to people were not saved by their charity, but by the fact that their service to their neighbors was made part of their offering to the Lord. The foundation of their life was sobriety, purification of the heart, and striving to obtain deification. In the words of St. Isaac the Syrian: “if you have fed a thousand people, but have not cleansed your own soul of passions, you have accomplished nothing.” What point is there in squandering yourself in many cares, which leaving your soul spiritually poor? Orthodox monasticism is hesychastic monasticism; there is no social monasticism in our Church.